This is not the first play I’ve written, and I hope it won’t be the last, but regardless, I’m pretty excited about this. I, NiftyNotCool, have written a play (cue trumpets and confetti)! This play is an adaptation of the Greek tragedy The Libation Bearers (also known as Electra if you read the Sophocles version), called Libation Bearers (The Flame). It is the second installment in the three-play Oresteia series produced by my friends in Rice & Beans Theatre, and will be directed by Pedro Chamale. Obviously, since the tragedy dates back to ancient Greece, the plot itself is not exactly a nail-biter. The gist of the story is pretty simple and well-known: In the ancient city-state of Argos, Queen Clytemnestra and her lover Aegisthus murder her husband (Agamemnon). 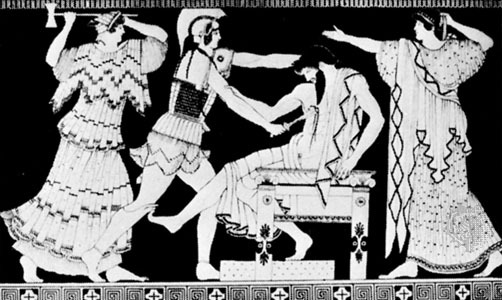 The Libation Bearers itself takes place years later, as Clytemnestra’s children (Electra and Orestes) plot to avenge their father’s death. That’s it that’s all. But not really. If that was all no one would bother adapting the play for contemporary productions (and there are countless adaptations of the Oresteia, for countless contemporary productions). Most of us know the what of the story (i.e., what happens, which we should all know now, because I just told you), but what seems to change from adaptation to adaptation, and even from ancient Greek version to ancient Greek version, are the how and the why of it all. That’s what was interesting to me when writing Libation Bearers (The Flame) and that is hopefully what will be interesting for the actors to explore and interesting for the audience to watch. Betrayals happen. Murders happen. Revenge is plotted. Today’s headlines are relatively similar (which is probably why these old stories live on). The reason we read past those headlines into the macabre news report below is because we want to know why this thing happened, and how such a thing could be possible. Sometimes, I think we want to see what separates us, law-abiding non-murderers, from those who commit horrible crimes. What are the steps that would have taken us to that place? What would we have done, in the same situation? Also contained within the question of how in an adaptation of an ancient work is simply the matter of how this story is going to be told. How does my script handle the events of the play? How does the rhythm of the language guide us through? How do the characters, as I’ve interpreted them, find their way towards their actions? Once the play is written, how does the direction affect the story? How do the actors interpret their roles, and blend their sensibilities and skills which the words they’ll be speaking? If the cast/crew list for this show is any indication, the how will be very exciting. My conversations with director Pedro Chamale about his vision for the show leave me confident that he is going to take my words and make them truly work (the only way they really can work, which is in performance). I respect the technical and stage management team. As for the actors, I’ve seen them all perform and studied with most of them. They are exciting performers. I’m excited. I’m very excited. I hope you will see the show. Libation Bearers (The Flame) will run for four nights only, November 21 to 24, at 8 pm in the PAL Theatre, 581 Cardero Street (Coal Harbour).